Into the Woods is one of those shows that feels like a comfortable, old friend. I basically grew up on a well-worn VHS of the original Broadway production, which seemed like a work so tailor-made to the remarkable original ensemble cast, featuring stand-out performances by Johanna Gleason (who won a Tony for her work) and Bernadette Peters, that woe to anyone who attempted to recreate the magic. I’ve since seen a number of productions over the years, and while they’ve each had their moments of brilliance, none of them have been completely satisfying or particularly revelatory. I’ve concluded that the material can hold up on its own if the director goes for honesty and truth in the storytelling and avoids any over-conceptualized approach. 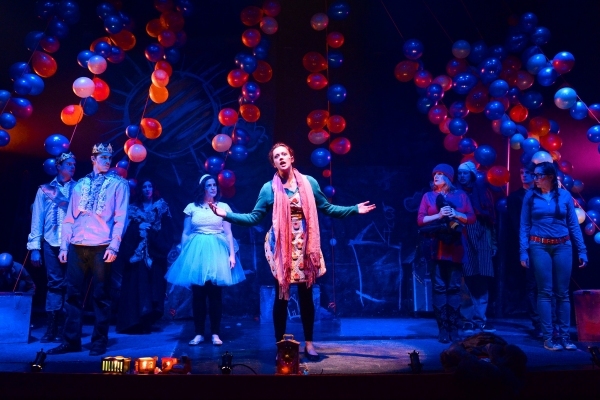 So, it was with some trepidation that I visited The Hypocrites’ production, as this is a company that thrives in deconstructing well-worn classics and finding bold, playful ways to tell the story. I also saw that the cast had been condensed, with actors doubling, even tripling their roles. And then I saw the production photos. But, I challenged myself to go with an open mind. I’ve gone Into the Woods enough times. It’s now considered a contemporary classic — let’s see what this innovative company can do to bring out new colors. And, in the end, I’m so glad I went. To me, it felt like this production is for those who grew up on the show. Considering those of us theatre nerds who discovered the show (and Sondheim) via a high school production or the OBC recording are now adults with families of our own, its themes of children, adulthood and family resonate deeply. It challenges us to see it new and reflect, while also offering a knowing wink at the material. And I guess this brings me to my issue. The actors, particularly those who are doubling and tripling parts, are constrained in their storytelling. I look at Hillary Marren, who plays The Witch, one of Cinderella’s step sisters and Cinderella’s mother. In doing so, she’s asked to snap into various personas, sometimes in the middle of a musical phrase. As a result, Marren has chosen to make her Witch stand out amongst her other duties by offering a stylized caricature with distracting Bernadette-esque vocal tics, which distances us from her story. Smartly, director Geoff Button has The Baker (the fantastic Joel Ewing) and The Baker’s Wife (a daffy Allison Hendrix) avoiding any double duty — they are the heart and soul of this show, after all. I’d also wager that the Witch is also one of those core roles — she’s the moral compass, the realist, the catalyst. She needs to remain a constant; not worrying about a quick-change. In general, the tone of this production feels a little too knowing, a little too self-aware, which in many ways undermines the message of growing up by going into the woods. BUT — and this is a huge but — despite all these reservations, I left the Mercury Theatre feeling like I “know things now.” I visited an old friend with a new perspective. Moments I took for granted in previous productions struck me in new and, dare I say it, revelatory ways. Sure, Button’s production annoyed me at times with its heavy conceptualization, but I found myself in a constant state of awe as this cast kept challenging what I expected from this show. Particularly in the last 20 minutes, which took by breath away – I won’t say any more but that you should experience it for yourself. It also didn’t hurt that the musical direction, by Matt Deitchman, is spot-on. Sondheim is well-represented by this vocally astute cast.